Polls are open until Sunday, April 6, 2014 at 11:59 PM EST. Enjoy! Love LttP, but Metroid Prime is one of the few rare games I consider to be in the same echelon as the N64 Zelda games. Link to the Past is one of the greatest games I've ever played, and I just played it for the first time like two years ago. Link's Awakening I never finished. But I've only played 45 minutes of Xenoblade at this point, so it basically wins by default. You guys shoulda voted for Uprising. (1) The Legend of Zelda: Link's Awakening (GB) vs. (3) Xenoblade Chronicles (Wii). Dude, I love Zelda. The good ones, anyway. Okay. NOW I'm just trolling. And gotta go with my console option over handhelda. Man, it's really too bad that LttP couldn't be the one up against Xenoblade. I really don't feel right voting against it, but I must give the edge to Metroid Prime. 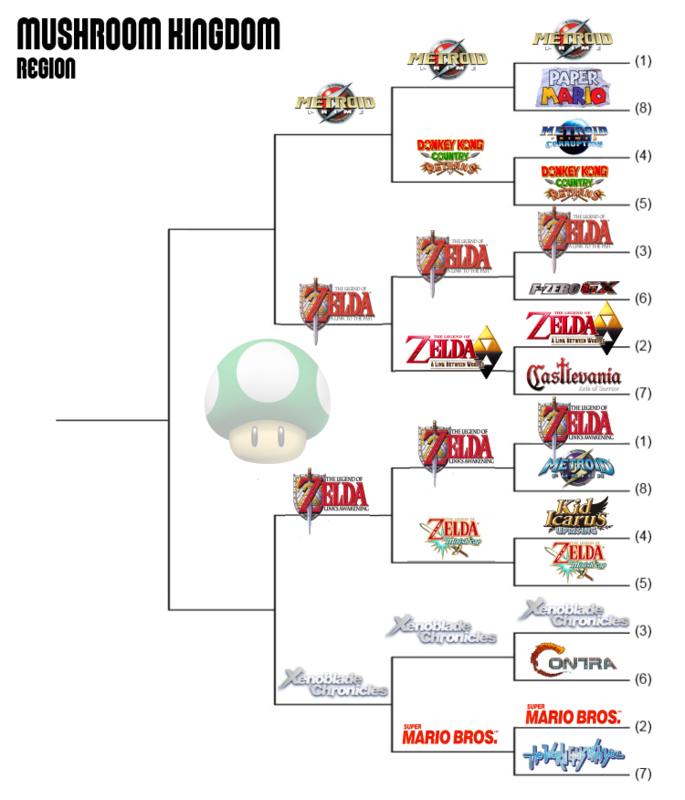 Only one Zelda should move on at this point…and it's my boy Link's Awakening. Zelda Vs Zelda! Let's do this. Plus Link's Awakening is my 2nd favorite Zelda after Majora. This is a hell of a match up. Oh god Metroid Prime versus Link to the Past. These are 2 of my top 3 games EVAR. Going off of my scores in the database Link to the Past has a perfect 10 and Metroid Prime has a 9.9. And yet... looking back on it I can't really remember why I thought Link to the Past was perfect and Prime was only *almost* perfect. Any issues I can find with Prime, I can find similar issues with Link to the Past. The second match is much easier for me. Link's Awakening was pretty great but Xenoblade is on a whole other level. Prime vs. LTTP is tougher. I don't know that I could go back to either today. Prime blew my mind back in the day, but I think I'd just find it tedious to go through again. And LTTP suddenly feels downright ancient after Link Between Worlds. In the end, I gave it to Prime. Metroid Prime is a masterpiece, the best Metroid along with Super, and the best game on the Cube as far as I'm concerned, but in the end I still prefer A Link to the Past. Choosing between Link's Awakening and Xenoblade is far more difficult for me, though; no matter which one I choose I'll end up feeling like I betray the other. Flipped a coin. Xenoblade it is.